For a medieval manuscript like the St Chad Gospels, exacting information is necessary to notice and document changes brought about by aging--thus, requiring photography. Inks, pigments, and vellum tend to deteriorate slowly and subtly, making the rate of decline near impossible to gauge. Without notice, small chips of pigment can break free, and when noticed, the prior condition of the pigment is near impossible to recall, especially in areas that include flaking and chipping. The St Chad Gospels is fortunate to have had various photographic efforts throughout the years, even if these efforts occurred sporadically and a number of them involved only selected pages. The value of these photographic efforts increases when their images are gathered and presented in a manner to provide scholars and conservators a means to compare images of the same page across time, comparisons that reveal significant information about a manuscript's aging. The overlaid historical images demonstrate that the St Chad Gospels has aged well over the last one hundred twenty-five years. However, a few areas exist where chips of pigments have broken free. 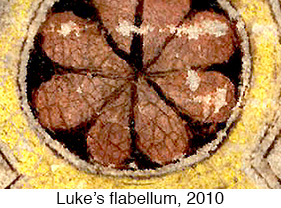 One of these areas occurs on Luke's robe, page 218. By comparing these various historical images, a conservator or scholar can establish a time period for such changes and gauge vulnerable areas on pages. The animated GIF on the right shows two chips of pigment breaking free on Luke's robe, one chip lost between 1929 and 1956, with a smaller chip lost sometime between 1962 and 2003. The smaller chip measures roughly .38 millimeters in width. For the St Chad Gospels, two significant, full-manuscript photographic efforts occurred prior to my 2010 imaging. In 1962, the Courtauld Institute photographed the complete manuscript during Roger Powell's rebinding. These images provide a significant benchmark for conservators and scholars because they were taken with the leaves separated from the manuscript and immediately following Powell's repair and straightening of the pages. Rebinding a manuscript is a rare occurrence. To have images from this rebinding, when the binding does not hinder the photography, is a rare treat indeed. Furthermore, with the photography occurring directly after Powell's repair of the pages, conservators and scholars have irreplaceable evidence for measuring and understanding the long-term effects of Powells' efforts. This understanding can provide knowledge to refine future strategies for repairing and caring for the inks, pigments, and vellum of early manuscripts. The other photographing of the complete St Chad Gospels occurred through efforts by the National Library of Wales, Aberystwyth. It produced three photostat copies, one copy presented to Lichfield Cathedral in 1929. Photostat copies are made with a photostat machine, which uses a camera to expose an image directly onto a roll of sensitized paper. The developed sensitized paper produces a paper negative, known as a black print. To produce the desired number of copies, the black print is photographed as many times as is necessary with the photostat machine. While a photostat copy does not provide the same sharpness as a photograph, the level of detail is ample to reveal changes in a manuscript, as seen in the above animated GIF. I used Photoshop to align all of the images to those I took in 2010. While the Courtauld's images offer a significant benchmark, I chose my 2010 images because they provided a higher resolution. However, this could be corrected by digitizing the Courtauld Institute's negatives rather than my efforts which involved scanning their 6"x8" photographs. I stopped short of exacting alignments to preserve a sense of variations dependent upon the state of a page when a photograph was taken. Prior to 1962, the pages of the St Chad Gospels's suffered from cockling, affecting how text and imagery appear in a photograph. Also, a manuscript's binding (especially its tightness) affects the contours of a page and how it appears in an image. The binding for the St Chad Gospels was remarkably different post and prior Roger Powell's work. Finally, conditions under which historical photographs are taken is impossible to know, especially those conditions' significant factors, such as relative humidity. The St Chad Gospels' pages are made from vellum (calf skin). Twelve-hundred-year-old vellum is extremely hygroscopic, absorbing moisture readily from the air. Changes in relative humidity cause pages to shrink or expand. Vellum responds far more dramatically to humidity than inks and pigments. Differences in relative humidity affect how script, decoration, and imagery align on a page when photographed, thus affecting any comparison of images taken at different times.